Ollie White of BlogF1 has written a post that may well be a significant indicator of true form of the teams over the off season. Titled Pre-Season Testing Comparison: 2008 vs. 2009, the article looks at the best times of each team at the Barcelona tests in 2008 and 2009. Statistics are as fickle a guide as testing itself, but Ollie's list contains so much interesting information that I just have to unpack it a little. For a start, it is immediately apparent that the 2009 cars are already faster than last year's. That is the opposite of what we saw in the early tests of the off season and shows how much every team has honed and improved their cars in a very short time. One has to sympathize a little with the FIA in its constant quest to slow the cars. It should be no surprise to us now that Honda/Brawn was the team to make the biggest improvement - a whopping 3.733 seconds is a huge chunk of time in F1. This must surely be yet more evidence that the BGP 001 really is as good as it has seemed in testing and could well be the car to beat in Melbourne. Note that I am still hedging my bets, however; I am not going to predict the constructors' championship for the team. Even with the extensive facilities of the Brackley base, it is hard to believe that Brawn GP can maintain their advantage over a full season against the likes of Ferrari and McLaren. BMW has similar facilities but flagged in the development stakes last year. I find it interesting that BMW is the next team up, with a healthy 2.085 second improvement. 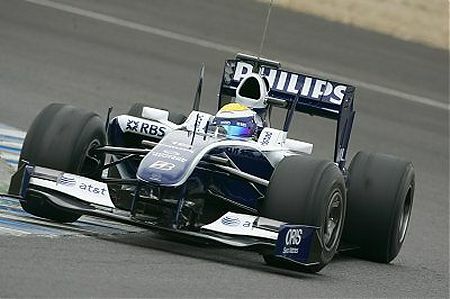 They were half a second behind the Ferrari at the 2008 test and went on to be just short of Ferrari pace through the season. But BMW's gain in the improvement stakes has wiped out the Italian team's edge so that their times in 2009 are almost identical. With Domenicali worrying about reliability and the BMW as solid as a rock, this may be a sign that the Beemer could win the struggle this time around. Ferrari gained 1.554 seconds over the year to be third in Ollie's list and immediately behind them is the Williams team (1.519 secs). That should augur well for Sir Frank's outfit but memories of how they faded last year curb my optimism. The team's weakness does seem to be in staying up with the development pace of the top teams and I have to conclude that they will have another year of patchy performances. Toro Rosso (1.452 secs) is the next team on the list but their figures are affected by not having the latest Newey design in the 2008 test. Had they been running the STR3 that early, one would have expected their improvement to be similar to Red Bull's of 0.682 seconds. In contrast, Force India's 1.188 seconds is entirely in keeping with their improvement this year. Red Bull too have gained little ground (0.682 secs) over the year and this confirms my doubt that Newey's clever design gives any advantage over the other teams. I have seen some very optimistic predictions for RBR and STR this season but Ollie's figures would indicate otherwise. And so to McLaren, uncharacteristically bringing up the rear (0.440 secs). I suppose that being one of the fastest one year means that any drop in performance will mean a smaller increment in the next. It is shocking to see the team at the bottom of the list even so. McLaren fans must just hope that the team make major gains at Jerez next week and arrive in Melbourne ready to give a strong account of themselves. We should be wary of reading too much into the comparison; it is about testing, after all, and we have no idea of the settings and fuel load used for each team's fastest laps. Ollie's post is wonderful fuel for speculation, however, and I propose it become a regular event in future off seasons. Good one, Ollie - the idea was sheer brilliance! Thanks Clive, I'm pleased you took the post further by giving some insights to what the data might mean to each of the teams this year. It makes even more interesting when you factor in what the teams are saying as well as supposedly doing. I put together a similar post as a response to a comment at the start of the off-season back in November, so I guess it's already a sort of regular event. Although like you, I take all testing times with a rather large grain of salt. It will be interesting to look back on the figures at the end of the season, Ollie - to see whether there is any link between it and actual performance during the season. Looking at your previous comparison, I don't detect any obvious hints to race results but that may be because I can hardly remember the pecking order in 2007! I was one of those with optimistic predictions for Red Bull, and as you and Ollie have pointed out, these haven't been borne out by their testing times. I had read that they were running with KERS in place, but inoperable, meaning that they were running at a weight disadvantage with out any of the benefits. It would be interesting to know if other teams have been doing similar, so we could get a more definitive insight into their pace relative to everyone else. As it is, we'll have to wait a couple of weeks to find out! It's possible but I don't really see the point of running with a disabled KERS. How would the team get some idea of how the car performs with it switched on? And, if the idea is to run without it in the early races, they wouldn't leave it in and so handicap their options with ballast. I should think they tried several configurations, with KERS and without it, and that would leave their lap times as still rather disappointing. i always love to start the day readin your blogging communities' pages. Now that season is aroun the corner, more stuff more fun. I have to say i think brawn gp will also improve through the year, may not be as fast as others. But it will be a reason for changinginsfs for more than one team i hope since mr brawn heads it. Also, hoping our (i am also a good supporter of beemers) fav team will give good comp to ferrari and mclaran . I suppose you would run with a disabled KERS if you wanted to work on car set-up with it in place, but you hadn't sorted its reliability. With the in-season testing ban, you would at least have some kind of base line to work from once you'd installed a functioning KERS system later in the season, without having to spend all of Friday practice trying to sort out the balance. Also Clive, sorry for posting in the wrong place, your RSS feed is not working, erroring out in my phone.. I wonder if McLaren's lack of pace can be attributed to the huge fine levied on them. At soem point $60,000,000.00 is bound to have some effect. I see the FIA's response to the diffusers is "Wait and see what the stewards say!" Deja vu!!! Arun: Thanks for pointing that out about the RSS feed. I have my techie working on it now! As for the diffusers, is it 2008 all over again? Aaarrgghh!